Genome rearrangement problems arise in both species evolution and cancer research. Basic genome rearrangement models assume that the genome contains a single copy of each gene and the only changes in the genome are structural, i.e., reordering of segments. In contrast, numerical changes such as deletions and duplications, which change the number of copies of genes, have been observed in species evolution and prominently in tumorigenesis. Here, we review various computational models of evolution by rearrangements designed for the analysis of species or cancer genomes, focusing mainly on genomes with multiple gene copies. Models differ in the assumptions taken on the genome structure and in the type of rearrangements allowed during their evolution. 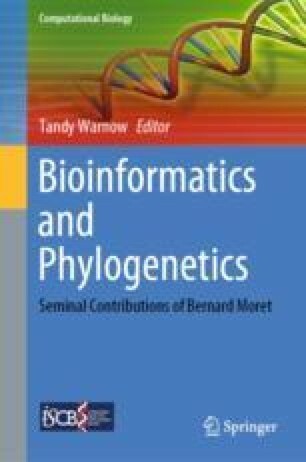 Most problems regarding genomes with multiple gene copies are computationally hard, and practical methods for their analysis are reviewed. As more high-resolution genomes become available, especially in cancer, better models and efficient algorithms will be needed. We thank Nimrod Rappoport for helpful comments. Study supported in part by the Naomi Prawer Kadar Foundation, the Bella Walter Memorial Fund of the Israel Cancer Association and by Len Blavatnik and the Blavatnik Family Foundation. R.Z. was supported in part by a fellowship from the Edmond J. Safra Center for Bioinformatics at Tel-Aviv University.